TOKYO (Nikkei)–The Nuclear and Industrial Safety Agency (NISA) said Saturday afternoon the explosion at the Fukushima No. 1 nuclear plant could only have been caused by a meltdown of the reactor core. The same day, Tokyo Electric Power Co. (9501), which runs the plant, began to flood the damaged reactor with seawater to cool it down, resorting to measures that could rust the reactor and force the utility to scrap it. Some news outlets are reporting that the meltdown was a level 4 which means it will only have local consequences. Whether this level changes remains to be seen. When this article was first posted a picture was used that turned out to be a fake. This was a clear accident and has been fixed. All information on this article is up to date and will be updated as more information comes in. 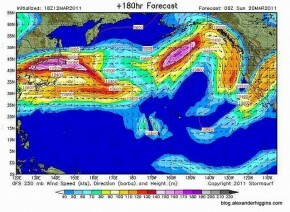 SEE THIS ARTICLE – Japan nuclear fallout map – HOAX – The problem with the hoax is that the map was consistent with actual jet stream maps but was labeled as official when it was not. Multiple alternative medicine specialists have been quoted as saying that the west coast is likely to get hit. The Associated Press, in an article that was released 23 mins ago(12:09pm pacific) has clearly shown that we are NOT out of danger at this point and that a meltdown seems likely. Last night when the explosion initially happened the Japanese media was reporting that there was radiation all over the area and the BBC was even quoted as saying there was simply nothing anyone could do. The Japanese Media is reporting that the reactor did NOT explode and that radiation levels are going down. How this is possible and if it is true remains to be seen. Multiple citizens around the area have already been hospitalized from radiation exposure. 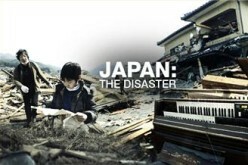 We are now some 30 hours into the Japanese earthquake and tsunami disaster that has devastated the region and killed thousands. New information is surfacing from sources by the minute. The fact that Japan’s Prime Minister has expanded the nuclear safe zone radius raises even more concerns as to the direction that this event is headed. There has been an explosion zone set up around Fukushima Daiichi nuclear power plant in Okuma, Japan signifying the probable meltdown of the plant. Officials in Japan and the U.S. are scrambling to resolve the situation. A total of 11 nuclear plants have went offline since the earthquake. Some of the Nuclear plants have been restored, however 5 remain in an imminent emergency status at this time. 2 of the 5 plants that are in imminent emergency status are critical. 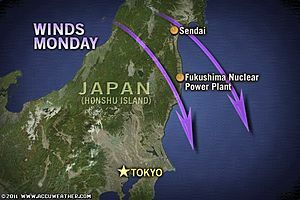 *Note: This map is a graphic depiction only based on wind flow and jet stream flow for example only (It is not yet known if the nuclear plant in question will actually meltdown) This is for reference only. Things are starting to heat up Saturday as the seriousness of this event is just now sinking in to the minds of most of the population. Looks like we will be in for a long week. If you live in Hawaii, or the wester U.S. (mainland) you might want to consider your options. 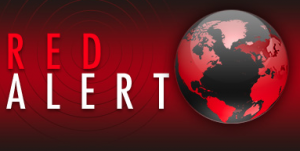 Some are now speculating that increased solar activity could be connected to the recent outbreak of earthquakes, along with fluctuations in the earth magnetic field and possibly HAARP. Massive solar flares have also been reported over the past week. WANT TO KNOW WHERE THE RADIATION WILL BE HEADED? IOSAT Potassium Iodide is recommended in the event of a nuclear disaster. Make sure you have some in your preps if not done so already and that your stock is current and not expired. “The amount of radiation reached around 1,000 times the normal level in the control room of the No. 1 reactor of the Fukushima No. 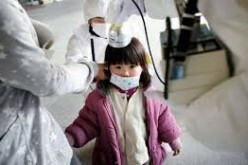 1 plant, the Nuclear and Industrial Safety Agency said. also why is there no mention in the media about the volcano eruption in Japan itself? The Intel Hub has posted a CBC video on their post CBC Reports On Possible Radioactive Fallout Hitting Canada!. 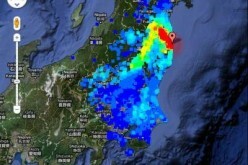 Accuweather address the issue of radiation reaching the US from Japan. Following Friday’s major earthquake east of Japan, fears were raised of radiations leaks and nuclear meltdowns at power plants. Radiation was reported to be leaking over the weekend from the Fukushima Daiichi nuclear power plant from one of the reactors that had lost its cooling system. CNN reports that a cooling system of a second reactor at the Fukushima Daiichi nuclear power plant failed on Sunday, forcing officials to expand the evacuation zone of surrounding residents from 10 km to 20 km (6 miles to 12 miles). Complicating matters, a second hydrogen explosion occurred at the plant early Monday. A state of emergency was declared on Sunday at a nuclear power plant in Onagawa, Japan, as well. Excessive radiation levels have been recorded following Friday’s earthquake, according to the United Nations’ atomic watchdog agency. Three reactor units at the Onagawa plant are being watched and controlled for radiation leaks and possible meltdown. The wind direction may impact where the radiation goes both at a local level and even across the globe. The wind direction at both of these locations are similar since the Onagawa power plant is located just to the northeast of Fukushima power plant. “The exact direction of the winds would have to be known at the time of the release of a large amount of radiation to understand exactly where the radiation would go,” according to Expert Senior Global Meteorologist Jim Andrews. It is unknown when a large release of radiation would occur, if at all, at this point. “You can calculate how long the release of a radiation would take to cross the Pacific from Japan to the U.S. by choosing different speeds that the radioactive particles might be moving and using the direct distance between given locations- say Sendai, Japan, and Seattle, Wash.,” Andrews added. However, even that calculation may not reflect how long the particle would take to cross the Pacific, since it would not likely cross the ocean in a direct path. This is the case because the wind flow is often a complicated pattern. 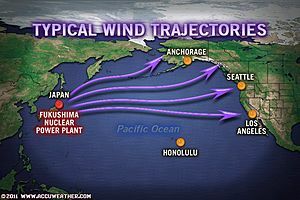 A typical wind trajectory across the Pacific is westerly, since there is often a large dome of high pressure over the central Pacific and an area of low pressure in the Gulf of Alaska. Any storm systems moving across the Pacific would add kinks in the westerly flow that would make the path of a particle crossing the Pacific longer. “In other words, it would be a very intricate and difficult calculation,” said Andrews. On a local level, it is easier to break down the direction of the wind. On Monday, the winds at the Fukushima power plant and the Onagawa power plant will generally be out of the north to northwest. 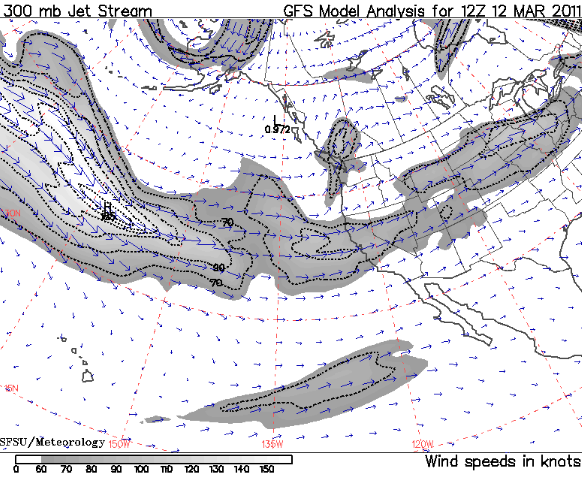 So, the wind flow will still be directed offshore into the Pacific. This would be a protective wind that would blow most of the radiation out to sea. The wind direction will switch to an onshore direction Monday night into Tuesday, threatening to send the radiation toward the population. “We are getting into the time of year where onshore winds occur most often,” said Andrews. This is not good news, since an onshore direction would blow most of the radiation toward populated areas. An added threat is that with higher elevations just about 4 miles inland from the power plants, if a temperature inversion sets up in the atmosphere, radiation could be trapped. Authorities have warned residents to keep windows and doors closed and air-conditioning fans switched off to eliminate the intake of air from outside.